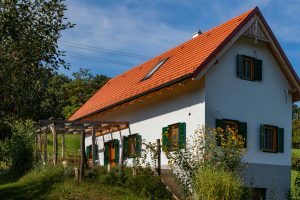 Holiday in South Burgenland from its most beautiful side! Our cellars are all located in the middle of the nature park “Weinidylle”, situated along the Pinkatal Wine Road. 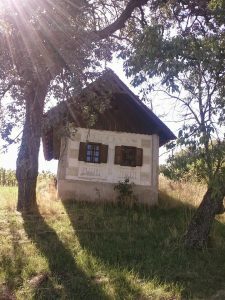 They are located between the villages of Moschendorf and Gaas or in the wine-growing region of Winten. Our love for the rustic Kellerstöckl in the idyllic landscape of the Pinkatal began some years ago. Back then we bought our first Kellerstöckl, renovated it and created a home for weekends and holidays, where we still enjoy every single second. 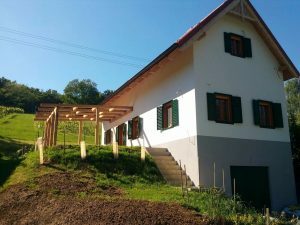 In 2016 the Kellerstöckl on the Liendlberg was built and one year later we were able to welcome our first guests. 2018 Kellerstöckl am Sauerberg followed. We bought, renovated and furnished it with a lot of heart and soul. From 2019, the first guests will also be able to move in there. At the same time we passed on the fascination of the Kellerstöckl to our dear friends Barbara and Robert. They also began to awaken a romantic Kellerstöckl from its Sleeping Beauty, renovate it and adapt it for rental – the Kellerstöckl “Am Satz” will also be open to our guests from 2019.
to welcome you soon as guests in one of our Kellerstöckl.